On our holiday in Durban last month we visited St Thomas’s Cemetery in Durban, high up on the Berea, where my great great grandfather Richard Vause is buried. I’d visited his grave earlier, with my grandmother, in 1968, and she had told me that she wanted to be buried there too, though whether she ever was buried there I don’t know. I’d visited a few years later and had some photos of the grave, but we thought it would be nice to have some digital photos as well, so we went to look for it, and could not find it after looking at almost every other grave in the place. Had I imagined it? Had it been moved? No, it was still there, but it was so big that we hadn’t seen it for looking. It was just about the most prominent grave in the place. In this picture you can see it, the one with the pillar and the urn on top. 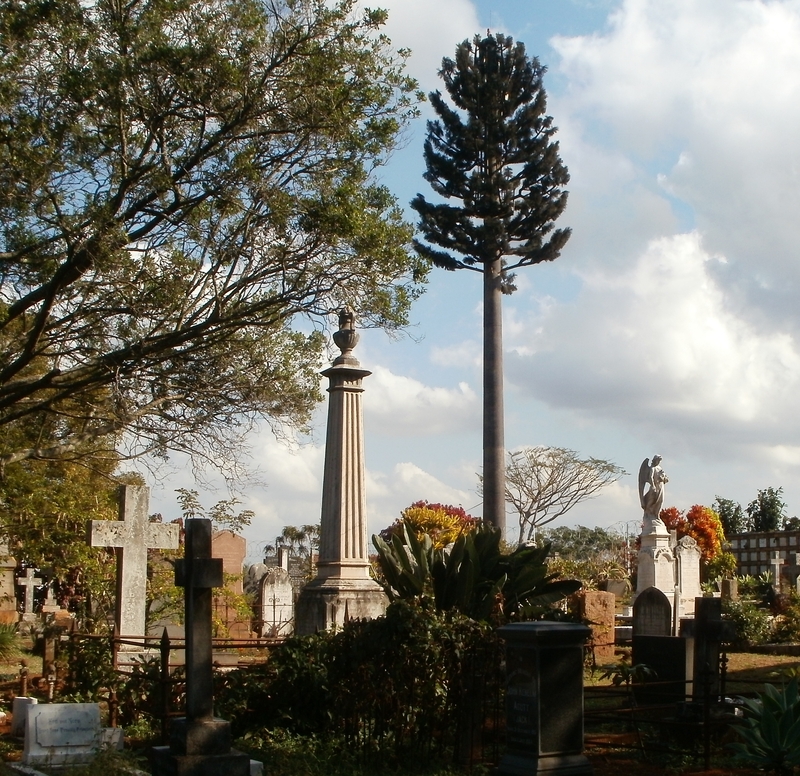 The Vodapine behind it is bigger — it is actually a cellphone mast owned by Vodacom, disguised as a pine tree. There are also Vodapalms and various other varieties of Vodadendrons. The current St Thomas’s Church is a bit further down the hill. The original one on the cemetery site was a wood and iron affair, replaced in the 1920s by the stone chapel that is there today, but is not used much. Richard Vause was one of the first, if not the first, churchwarden of the old St Thomas’s, and he lived a little way down the hill in what may still be called Vause Road with his wife Matilda (nee Park) and their eight children. 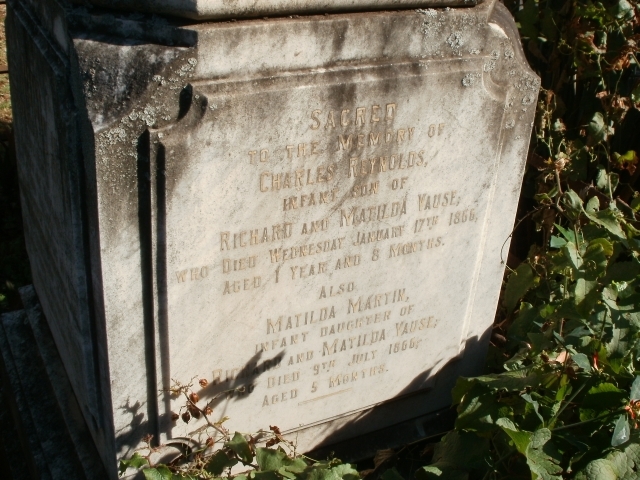 Their son Charles Reynolds Vause was the very first to be baptised at St Thomas’s, and is the fiorst entry in the baptism register, and was probably one of the first to be buried in the cemetery also. He and his sister Matilda, the two youngest of the Vause children, died young. 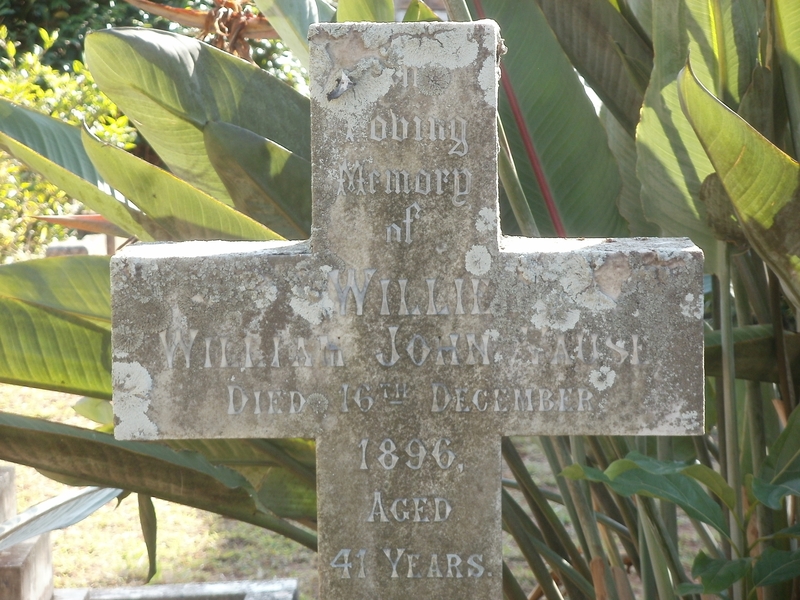 The second son of Richard and Matilda Vause, William John Vause, who died at the age of 41, is also buried in the plot. He married Jessie Cottam, but they had no children. 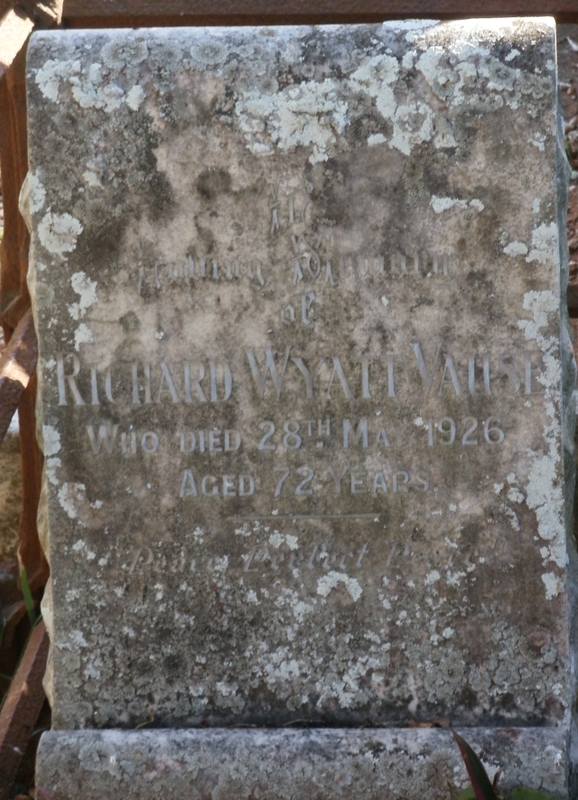 William John Vause’s elder brother, Richard Wyatt Vause (my great grandfather) married Maggie Cottam, Jessie Cottam’s sister, and Maggie Cottam also died young (but was buried in Pietermaritzburg). Jessie Vause, then remarried Gordon Parkes, but had no children by him either, and brought up her dead sister’s children. Richard Wyatt Vause, known as Wyatt to his friends, lived as a widower. Memorial to Wyatt Vause (1854-1926), my great grandfather. There are several other members of the Vause family buried in the same plot. 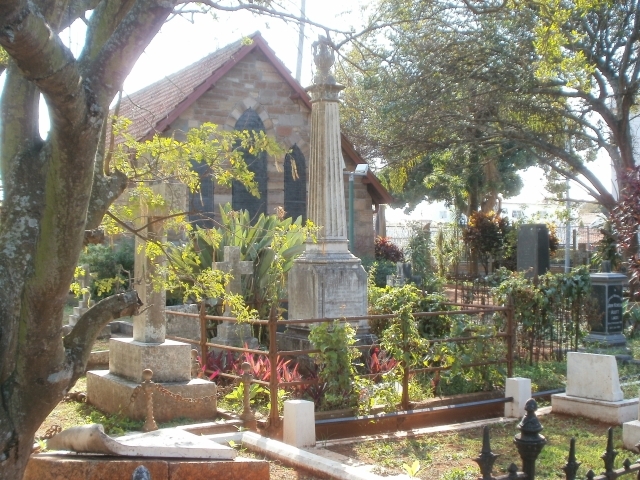 St Thomas’s Cemetery, showing the current chapel, and the Vause grave, with the urn on top of a pillar. The cemetery also contains the grave of Julia, the daughter of nCaptain Allen Gardiner, RN. 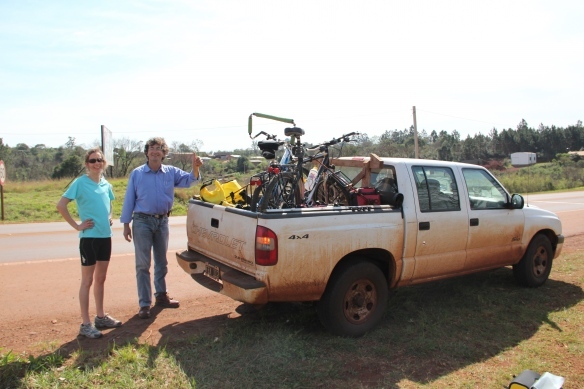 After retiring from the navy, Gardiner became a missionary, and went to Zululand. There he met a hostile reception from King Dingane and his people, so he returned to Durban, and established himself on a hill above the town. After finding the people there more receptive to his message he named the hill Berea, after the place where St Paul met a better reception than he did in Thessalonica (Acts 17:10-12). Allen Gardiner is not buried at St Thomas’s Cemetery, however. He went on to South America, where he died of starvation on Tierra del Fuego, and the South American Missionary Society was started in his memory. Chaffey & Chaffin families — the same? which describes someone else doing something similar. When it happens one, it is odd. When it happens twice it begins to look like a conspiracy!